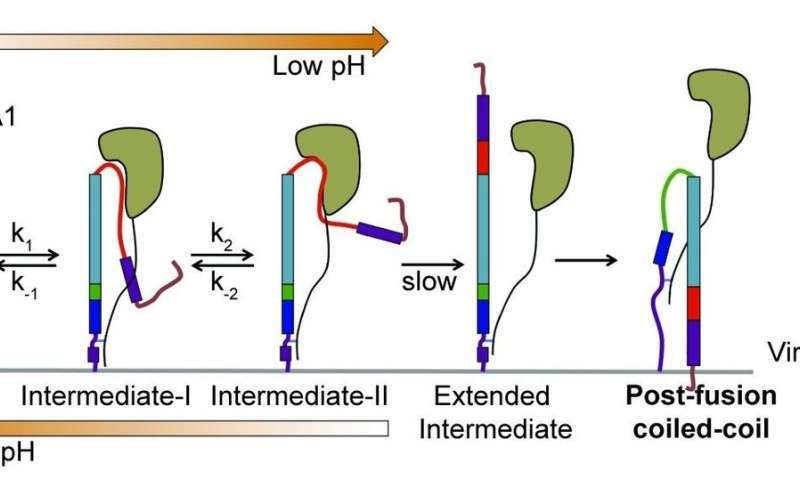 "Envelope proteins have been described as old-fashioned mousetraps, set in a static, spring-loaded state, waiting to be triggered by interaction with a target cell," said the study's senior author, James Munro, Ph.D., assistant professor of molecular biology and microbiology at Tufts School of Medicine who also teaches at the Sackler School of Graduate Biomedical Sciences at Tufts. "Once triggered, they undergo a dramatic change in their three-dimensional structure, enabling fusion and entry into the target. However, despite some hints in previous research, this process hadn't been directly observed, and it was widely thought that each protein molecule on the surface of the virus had only one chance to spring its trap." Using an advanced imaging technology—single-molecule Förster resonance energy transfer, or smFRET, which measures nanoscale distances within single molecules labeled with fluorescent dyes—and then performing significant computational analyses of the data, the Tufts researchers generated the first real-time visualization of the changing shape of individual HA molecules seeking cellular targets. To facilitate the experiments, the HA molecules were imaged while on the surface of an unrelated virus. Research is still needed to prove repeatability and reversibility of these protein dynamics in viruses other than flu, and visualization experiments using inert, non-infectious Ebola particles are underway in Munro's lab. Munro is the recipient of a National Institutes of Health Director's New Innovator Award to support use of single-molecule imaging to investigate how viruses such as Ebola enter host cells.